You’ve chosen a destination and called a few days off of work. The kids have a break from school and the whole family is geared up, ready for the upcoming adventure. It’s time for a camping trip! 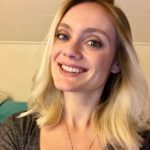 But hold on a second: Do you have everything you need? And are you sure your rig is ship shape and ready to go? Getting ready for a vacation is fun and exciting, yes, but it can also be a little bit stressful. There always seem to be a lot of ducks waiting to be rowed up before you’re set to go. And the pre-trip frenzy can be even crazier when RVing is your preferred mode of travel. You’ve got to pack a whole lot more than a suitcase — not to mention making sure all your camper’s systems are clean, prepared, and in good, working order. But don’t worry! We’re here to help. 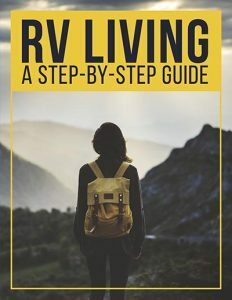 We’ve put together an RV departure and walk through checklist, so you can make sure everything’s set to go before driving off into the sunset. Here’s our quick guide on what you need to check — and double-check — before you head out on the road. We’ve also got some great RV packing tips for beginners. … and that’s about it. When you’re being whisked away to your destination by airplane, packing as lightly as possible is the mantra. After all, those carry-on bag size requirements seem to keep on getting smaller, and no one wants to pay $25 just to check a bag. But in an RV, you’re traveling in a house on wheels. And houses require a whole lot of accessories. Think about all the things that you use every day in your home. If you actually sit down and go through a regular day in your mind, you’ll notice it’s a pretty long list — including sheets, pillows, window shades, dishes, and silverware, just to name a few examples. To make your RV a home away from home, you need to ensure it’s stocked will all those items. Otherwise, you might open your kitchen drawer expecting to find a fork… and discover instead that you’ll be forced to eat your salad with your fingers. 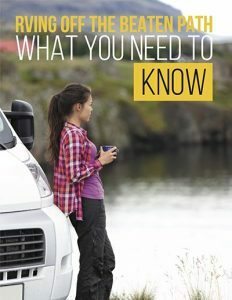 So when you’re going through your regular travel packing list, you’ll want to add a few specific things that are needed for RV camping. Here are a few RV camping necessities that are easy to overlook when you’re packing. As you can see, an RV camping checklist can be pretty lengthy. All that stuff is on top of the regular list of goodies you’d normally bring along on a trip — stuff like shampoo and conditioner, sunscreen, and activity-appropriate clothing. But as important as it is to make sure you’ve got all your camping supplies, essentials, and equipment, it’s even more important to make sure your rig is all setup and ready to go after you’ve packed it. No one wants to get a few miles down the road only to discover they’re riding around on a quickly-flattening tire. Grab your pressure gauge and give each of your rig’s tires a check before you head toward your destination. It’s not just a matter of convenience — your family’s safety is at stake! It’s a cruel fact of life that RVs almost always usually succumb to water damage. There are just too many moving parts, which make for seams and seals where water can get in. We already recommend you check your RV for signs of water damage regularly. But if you make sure to give it a thorough once-over every time you’re heading out on the road, you’ll be that much less likely to find an unpleasant surprise. And while your trip will likely have to be postponed if you do find water damage, at least you’ll get to deal with it at home — where you have a safe, non-leaky roof over your head! 3. Double-check your trailer connection, if you’re towing. Towable RVs are awesome. They’re affordable, spacious, and flexible. But pulling an RV comes with a lot of responsibility. And the very first one is making sure your connection is safe and tight. Always check your tow hitch setup thoroughly at least twice before driving away. Otherwise, you could be a danger not only to yourself, but to others around you on the road. 4. Make sure the antenna’s down, the stairs are in, and the leveling blocks are removed. I can’t tell you how many times I’ve seen RVs driving down the road with their automatic stairways extended. Sure, it’s a little funny… but it could be hazardous to other cars, not to mention cause serious damage to your rig if they should get stuck on something! Making sure all these small details are taken care of is one of the main purposes of a walkaround, where you can visually see if you’ve accidentally forgotten something. 5. Make sure you’re not connected to electricity or sewer. Another common RVer mistake… but potentially a very messy one! If you know you’re forgetful, it can be very helpful to use this clever invention called RVminders (and no, they’re not paying us to tell you that). Simply slap them onto your steering wheel, and you’ll never forget to do your walkaround again. Stay safe out there — and enjoy your camping trip, now that you’re all ready to go!